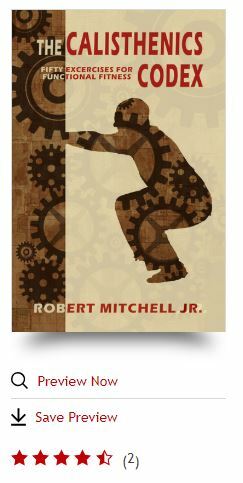 My (Still) Bestselling Calisthenics Book | Robert Mitchell Jr. I have 4.5 stars on Kobo, see? I still can’t believe my Calisthenics eBook has been a bestseller for over three years. It’s still #3 in Health and Fitness at Smashwords, although it has fallen from an all-time high of I think #19 all they way down to #37 at B&N. Reviews average 4 out of 5 stars. And how much money does a writer make from a bestselling eBook on Calisthenics? About $30/month, a few hundred bucks a year. So how about helping a brother out? Go get yourself some! Only 3.5 stars on Scribd. What can I say — haters gonna hate. This entry was posted in Writing and tagged calisthenics codex. Bookmark the permalink.